Bob is petting and caring for one of the 3 therapy dogs that were recently purchased, along with 3 therapy cats, by Alzheimer’s Family Center (AFC) for their patients. Manufactured by Hasbro, these “pets” are in reality robots that were specifically designed for individuals with Alzheimer’s disease or another dementia. And it does wonders. The robots react when they are being petted, turning their heads, moving their paws, or barking and purring. The purchase of these companions was made possible by the generosity of our donors. 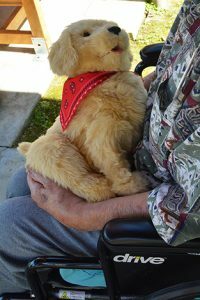 They are a great addition to the pet therapy – with real dogs – that is offered on a regular basis to the patients. Other exciting programs are being implemented this spring, such as meditation and podiatry. IPods were also purchased for our patients to listen to music at their free will.